Soulful Stuff Powerful on mate te, maustettu pähkinäisellä sitruunan maulla. Sometimes we are stretched to our limits. We feel weak and tired. We would like to sleep for 12 hours straight to simply regain our strength. Yet often in these situations we have to become awake and show our complete commitment. 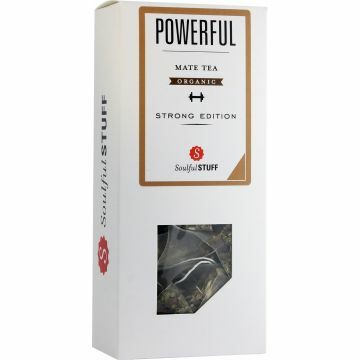 For such moments - but also now and then - we created our exciting organic "Powerful" mate tea with the taste of ginseng-guarana and a light lemon note. Power on! 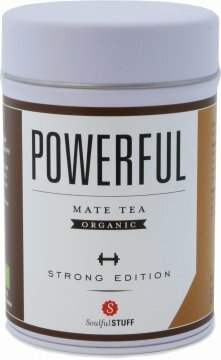 Ainekset: Mate tee * (58 %), paahdettu kaakao *, moringa lehdet *, gojimarjat *, luonnollinen aromi, guarana-jauhe * (2 %), ginseng-juuri * (2 %).